Give more, stress less: that's SSB's holiday motto. Here's how to make it your reality! If you're like most Americans, you'll be doing some online gift shopping. 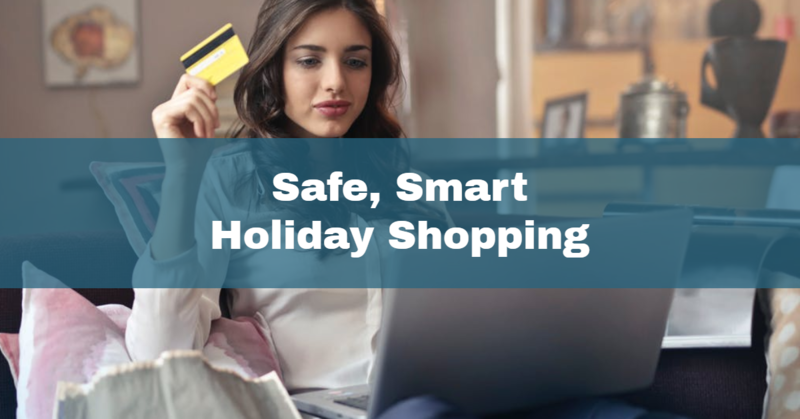 We've put together a list of tips to help you avoid holiday hassles. That leaves you more time, energy and money to enjoy the season! Always look at your budget before you shop. Your holiday gifts should come from extra money in your budget or from a dedicated holiday shopping fund - not from your retirement savings or your emergency fund! SSB offers a yearly Holiday Club passbook account that gives you one of our highest rates of interest; you can start saving now for a stress-free Holiday 2019! If you don't have room in your budget for gifts, remember that it really is the thought that counts. Here are some free/inexpensive gift ideas, and here are some holiday resources for families in the Allegheny County Area. Make your gift list early. You don't have to wait until Cyber Monday to decide what you're going to buy. Start doing your research in advance. Decide what you want to get everyone and where you can find it, then research return policies and shipping costs (those can add up!) That way, you won't have to worry about items selling out or deals expiring before you're ready to checkout. Follow your favorite retailers via social media and email. Businesses are likely to post deals, promos, and inside info on their profiles. You'll likely even start to see ads for the items you browsed - sometimes with an extra discount! You can always unfollow them when you've completed your shopping. Retailers will be sure to give you a heads-up on their sales and specials via email, too. Many even offer a discount on your first order if you sign up for their newsletter. You'll get a ton of promotional emails around the holidays, but you can always unsubscribe. Look online for coupons and savings. Check RetailMeNot for coupon codes that you might be able to stack. Or, download the Honey browser extension to make sure you're always getting the best deal. Be sure it's a legitimate, safe website. Make sure you're on the retailer's official website before clicking "checkout." If you're not familiar with a retailer you want to buy from, Google the company's name with "scam" to see if there are many online complaints about them. Look for the SSL security lock icon in the URL bar before entering payment information; if a site does not have SSL, it means they're handling your credit card information without proper encryption. If anything goes wrong - like seeing unauthorized charges or accidentally buying from a scammy website - it's good to have support. That's why SSB offers our customers IDShield from LegalShield. You'll get the IDShield Vault Password Manager, Credit Inquiry and Credit Score Tracker, Identity Theft Restoration, and unlimited consultation and support. Take advantage of SSB's discounted rates!